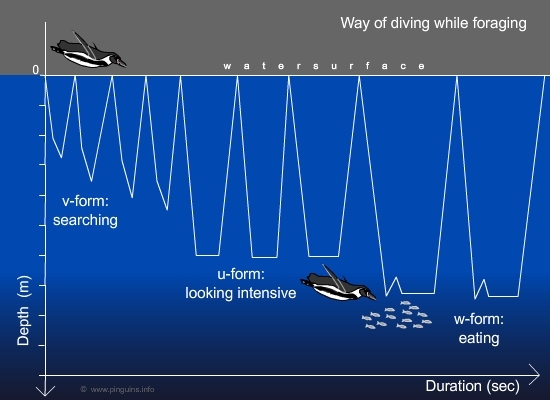 The depth of diving depends, just as with the speed before, on the size of each species. The depth record for an emperor, with a weight of 27 kg, is 535 m, measured by the American scientist Gerry Kooyman in McMurdo Station on Antarctica. Therefore the bird had to hold his breath for 15,8 minutes. 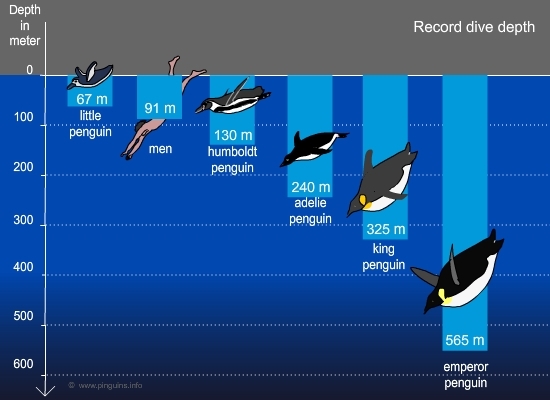 African penguins dive regularly till 30 m, and their diving depth record lies with 130m. 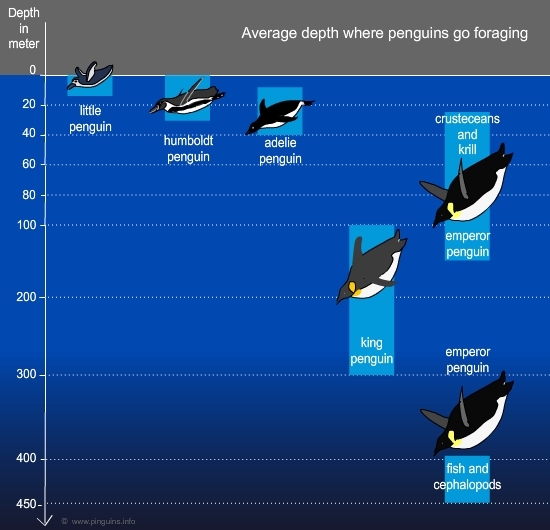 King penguins can dive till maximum 325 m. Adéliepenguins swim almost all the time on a depth from 0 till 40 m, although their record is 240 m. And the smallest species, the little, remain mostly above 10 m, and dive rarely deeper than 30 m.
Scientists determined that the depth depends on the fact if the bird is still searching for prey or already has located food. Penguins on the hunt for prey, swim mostly a few kilometres close to the water surface and then start diving in V-form down and back. With each dive they go a bit deeper. When they reach the bottom of the sea or they want to closer examine a certain depth, this V-form becomes a U-form. They dive, swim on that certain depth horizontally further, and surface again. As soon as they located fish, they dive in W-form down-and-up to eat.